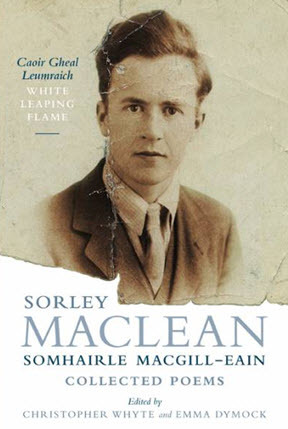 “PUBLISHED to coincide with the 100th anniversary of his birth, and surely the definitive collection of his work, this Collected Poems of Sorley MacLean – ‘Caior Gheal Leumraich’/ A White Leaping Flame – brings together previously unpublished works, lines cut from work, published poetry from MacLean’s own edited volumes of poetry and work previously published in various magazines, literary journals and anthologies. With works presented in their original Gaelic with English translations, the beauty and pragmatic works of MacLean are easily accessible to all. A biographical summary at the beginning of the tome explores the writer’s life, from his childhood in Raasay through his life at university and war experiences, and examines his effect on Gaelic and Scottish literature, as well as his literary, political and philosophical influences including Gaelic tradition song, Romanticism and Modernism, as well as Communism and Fascism. The collection can be purchased from the publisher (which also contains some wonderful links to Somhairle reading his own poetry) or from here.